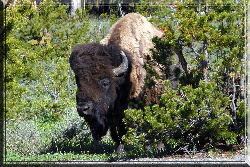 Upon entering Yellowstone, I wondered how long it would be before we viewed our first Bison. As it turned out, we were met by this solitary bull about an hour inside the East Gate Entrance. We found hundred of bulls easily but the small matriarchal herds of cows and calves were much more illusive.